College accommodation fees have risen every year for the last nine years at rates which are yet to be justified by the University. #RippedOff calls for the University to re-evaluate the cost of accommodation and make Durham’s unique collegiate experience accessible to all. Over the past three years Students’ Union Presidents have gained University agreement that fees won’t be increased by arbitrary amounts, commitment to a review of differentiated pricing, commitment to an increase in funds for bursaries and to a tiered bursary system and agreement to a report to show how colleges are funded, due this September. But there’s still a lot of work to do, because despite our extensive paper to the University executive council, accommodation fees have risen again by 3.38% for the 2019/20 academic year. You can read more about it here. If you want the latest updates from the campaign follow our President George on social media. Durham SU lead a student sleep-out outside the Vice-Chancellors home to protest accommodation fees rising by over £200 to help cover an £8 million university refurbishment bill. The University announces they have increased accommodation fees by 13% for the 2011/12 academic year. The SU commissions an external body to establish the cost of living in Durham to provide a comparison with college accommodation fees. Accommodation fees spike again as the University announces a 9% increase for the 2015/16 academic year. University justifies increase in accommodation fees by claiming an expected rise in the cost of gas, electricity and food prices. Students launch petition in protest against soaring accommodation fees, gaining over 2000 signatures. Student representatives push for greater transparency from the University asking to know where the money paid by livers-in goes. Durham Students for University Reform (DSUR) organised a student protest marching through the Palatinate Centre demanding a freeze in accommodation fees. Students held a ‘Funeral for Accessible Education’. Led by a ‘grim reaper’, students carried dying or wilting flowers to be placed into a coffin representing the death of affordable and accessible education. Students organise Alternative Durham Open Days to highlight how the extortionate accommodation fees are costing people out of Durham. Durham for Accessible Education launched a petition asking for improved financial support for students struggling to meet accommodation fees. #RippedOff is born after a policy is passed at Assembly. #RippedOff’s first action is a change.org petition, which received over 2,000 signatures from dissatisfied students. #RippedOff has its first success, as the University commits to setting up a group to look into differential pricing. 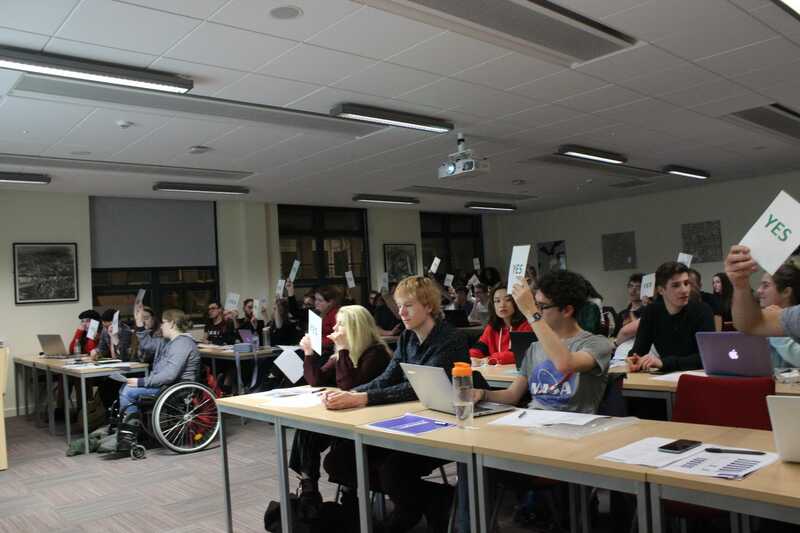 A demonstration is planned to take place outside the University meeting discussing next year’s accommodation fees (SFAAG), but at last minute the University disappointingly move the meeting outside of term-time. SU President Alice Dee, in an effort to ensure the voices of students are still heard, hand delivers a hard copy of the petition to the Vice Chancellor. Accommodation fees for 18/19 are announced as rising by 3.5%, adding inflation to an already extortionate rate and ignoring demands by students. An emergency demonstration takes place (run by Durham Students for University Reform), which ends with the storming of the Palatinate centre. Another demonstration takes place outside the Palatine Centre, featuring speeches from several students. 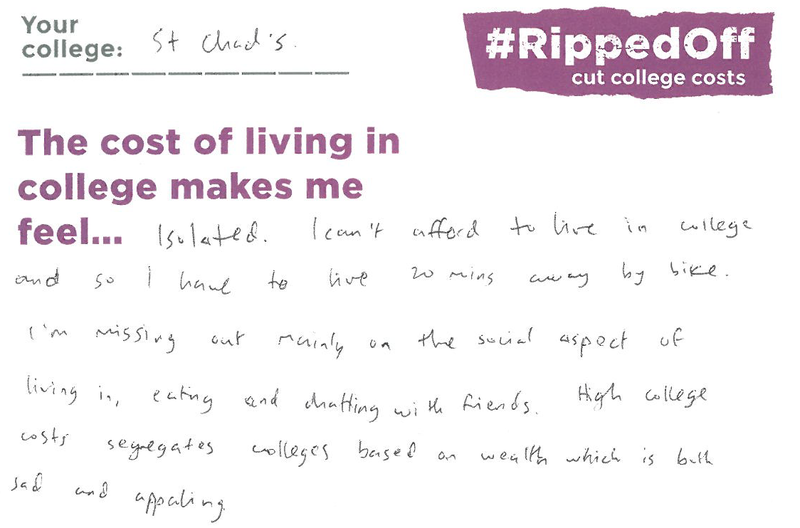 Students fill out postcards explaining why they feel #RippedOff. Responses are heart-breaking, telling of elitism, isolation, and financial difficulties. After extensive research from SU staff, a 13-page proposal is submitted to SFAAG detailing the feasibility and necessity of a freeze in fees. The University responds with an inadequate 59-word ‘no’. Megan Croll rallies students on Facebook live and organises a meeting to discuss the next steps of the campaign. George Walker and David Evans hand out flyers at the University Open Day, informing prospective students about the extortionate fees. The action clearly scares the University, and George and David are asked to leave the premises. The University commits to a new tiered bursary system after lobbying from SU President Megan Croll. This gives more students access to appropriate financial support. University releases accommodation fees for 2019/20, and yet again, despite the strong student anger, they rise. Expecting a report from University about how colleges are funded. This report has not been received. Transparency is questionable. A satirical ‘Pay Your Cards Right’ game creates more interest for the campaign and attracts the attention of the press. 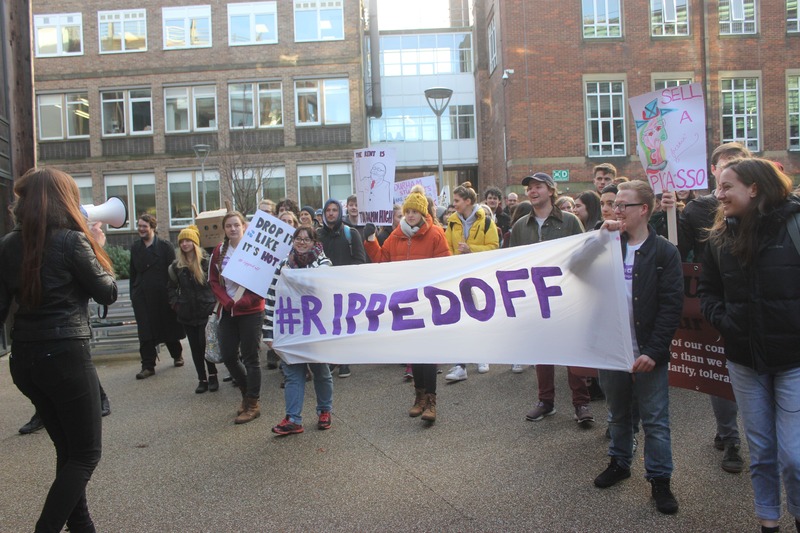 #RippedOff gains the support of the local community after a motion is passed unanimously at a Durham City Parish Council meeting to oppose the rise in fees. Hundreds of students attend a de-matriculation themed protest attracting lots of press attention. It’s the biggest #RippedOff protest yet, with 257 people signing the de-matriculation book. A report is expected from the University by the end of Michaelmas Term outlining how colleges are funded. 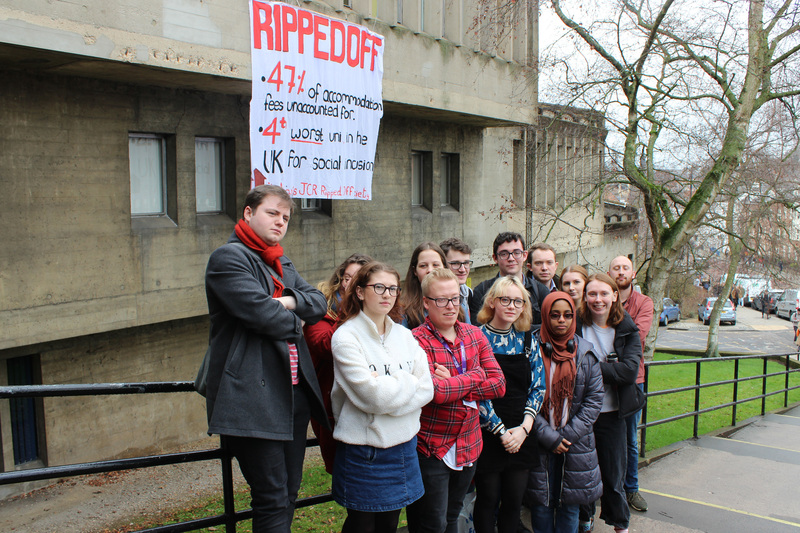 JCR presidents unite against the rising fees, voting to support #RippedOff. A motion guaranteeing the support of each college is passed in all colleges’ JCR meetings. Aidan’s create a #RippedOff task force, taking the lead on their college-led activity. 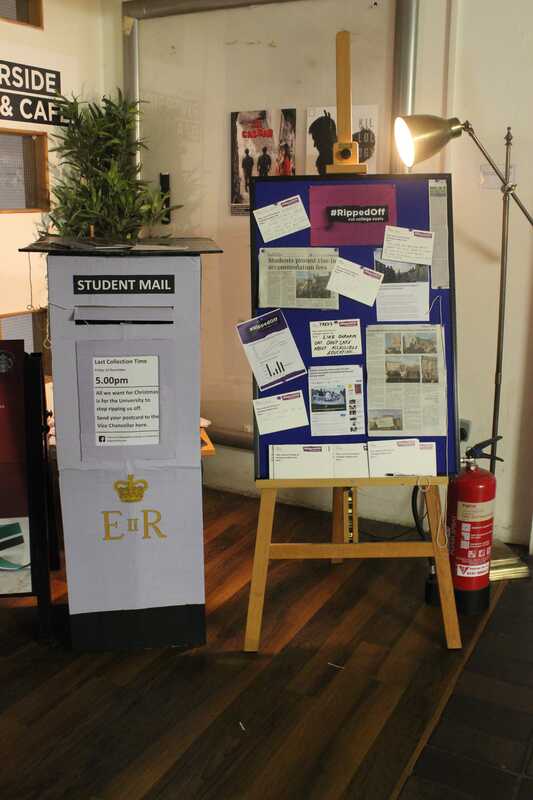 Students send handwritten postcards to the Vice Chancellor about the effect the cost of college has on them. George receives acknowledgement from the Vice Chancellor responding to the postcards he received from students. A student takes a motion to Assembly asking the relevant Officers to provide support to student groups undertaking rent strikes. 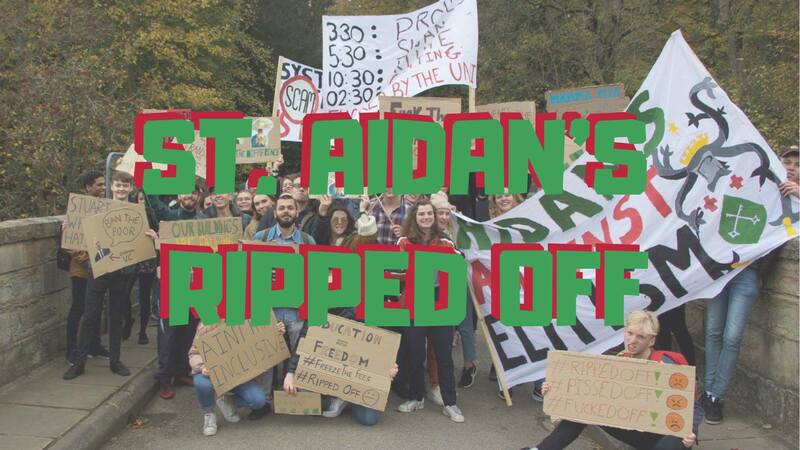 Student Officers join members of the St Aidan’s Ripped Off society outside the SU to call the university out on the lack of transparency around accommodation fees and the low rate of social inclusion at Durham. This event was part of a National Day of Action aiming to raise the profile of the nationwide housing crisis. #RippedOff will not be silenced. 2018/19 will be a year of continual escalating action. Keep updated on the campaign’s next steps in the Facebook group.